As an up-and-down regular season is about to come to a close, the Ripley Wolves gave notice to the North Division that they’re just starting to click as a team. And, with the playoffs starting the first weekend of February, their timing couldn’t be any better. The Wolves hosted the fifth place Durham ThunderCats on Friday night, with the Wolves trailing them by six points in the standings. Not only did the Wolves have to win this game to keep pace, but also win their last two games and hope Durham lost their final three in regulation, which would give Ripley fifth place. Although a long-shot to claim a date against fourth-place Shallow Lake in the first round of the playoffs, Ripley did their part on Friday night, winning 5-2. Kurt Edwards played, undoubtedly, his best home game of the season, keeping the ThunderCats at bay with 41 big saves, including a second period barrage that could have turned the game in Durham’s favour but instead left them behind 3-1 after two periods. With Edwards standing on his head, the Wolves were able to work the puck in the offensive zone, take chances and take the game in convincing fashion. Goals were scored by Corey McCrae (powerplay), Nathan Gavey, Paul Stewart (a shorthanded beauty from Gavey and Edwards), Jeremy McQuillin and Shawn Stewart (shorthanded empty-netter). Aside from Gavey, who added a second assist, and Edwards, other helpers went to Tim Dwinnell, Mark Stanley, Travis VanGaver (2) and Ryan Armstrong. On Saturday night, the Wolves inducted four key people in the franchise’s history in its second annual Wall of Fame game. 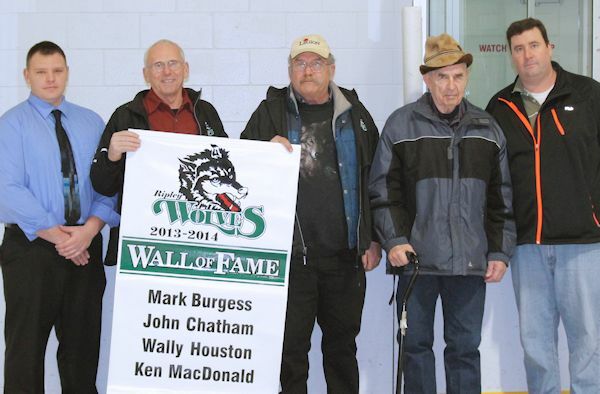 The late Mark Burgess, represented by his son and former Wolf Mike, John Chatham, Wally Houston and Ken MacDonald took their place in Wolves history in a pre-game ceremony before a great crowd. The commitment and contribution to the success these gentlemen have provided the Wolves will always be appreciated. Ripley got off to a fantastic start in their final home game of the regular season against Shallow Lake, scoring three goals in the first period, including a shorthanded marker by Tyler deVos early in the first (unassisted), followed by a Gavey goal and a Stanley powerplay marker. Assists went to VanGaver, Nick Locking, Brian Stanley and deVos. Unfortunately, the ice quickly tilted the other way to end the period, as the Crushers pounded three goals in the final three minutes of the first behind Edwards, ending the period squared at threes. Although the second was not short on entertainment, the score remained deadlocked entering the third, when Ripley took a lead with just under 14 minutes remaining when P. Stewart scored unassisted. From there on out it was all Edwards, frustrating Shallow Lake on his way to making 12 third period saves. Just when the Wolves looked like they’d hold on to the final buzzer, Shallow Lake scooped up a loose puck and buried it behind Edwards with just nine seconds remaining in regulation, sucking the air out of a building that knew anything short of a win would end the quest for fifth spot in the standings. Some teams may have hung their head and lamented the close call, but the Wolves instead scored one of their prettiest goals of the year. Rookie Jarred Colling picked the puck up at his own blueline and spied M. Stanley breaking down the left side of the ice towards Shallow Lake’s end. Colling threaded a beautiful pass through some sticks and hit Stanley at full flight. He beat a defenceman, manoeuvred around the goalie and deposited the game winner for a 4-3 final. The Wolves will end their regular season this weekend in Shelburne before discovering who their first-round opponent will be. Regardless, they’ll start with a road game the first weekend of February, followed by Game 2 at home. Watch http://www.ripleywolves.com, Facebook and Twitter @RipleyWolves for game times. It was a tough weekend for the Ripley Wolves, as they failed to gain any points in two weekend games. On Friday night, the Wolves travelled to Palmerston to face the first-place Mapleton-Minto 81s. The Wolves hung tight in the first period, which ended scoreless. The floodgates opened in the second period though, as the 81s pounded four goals by Wolves netminder Kurt Edwards, while Paul Stewart and Tyler deVos kept the game close at 4-2 after two. Assists went to Shawn Stewart, Zac McIntosh, Jarred Colling and Nick Locking. The third went to Mapleton-Minto, as they scored two more insurance goals to take the 6-2 win. On Saturday, the sixth-place Wolves were in Shallow Lake looking to gain ground on the fourth-place Crushers. The Wolves trail Durham by four points and, if they can catch them, they’d most likely face Shallow Lake in the first round of the playoffs in early-February. The Wolves opened the scoring when Locking scored from deVos. The first ended in a 1-1 tie. deVos had the only Wolves tally of the second period, unassisted, which gave the Wolves a short-lived lead. Shallow Lake tied it six minutes later and the period ended in a 2-2 deadlock. A Wolves penalty early in the third gave the Crushers the chance they’d need for their first lead of the night, and they seized it, scoring a powerplay marker. Minutes later they stretched their lead to 4-2. It stayed that way until P. Stewart scored a shorthanded marker to bring the Wolves within one with about eight minutes left in the game. The assist went to Jeremy McQuillin. The Wolves battled hard and Kurt Edwards, who made 29 saves in the game, kept them within one until he was pulled for an extra attacker. With the net empty, Shallow Lake sealed the 5-3 win. The Wolves travel to Lucknow next Saturday night, Jan. 11, with the puck drop at 8 p.m. The Wolves then return home with games on both Jan. 17 and 18. The Ripley Wolves split weekend games on Dec. 27 and 28 to end the 2013 portion of the schedule. On Dec. 28, the Wolves travelled to Port Elgin and threw a scare into the Saugeen Shores Winterhawks, but couldn’t hang onto a lead and lost the game 8-5. Scoring for Ripley was Brian Stanley (2), Jarred Colling, Nick Locking and Jeremy McQuillin. Assists went to Tyler deVos (2), Brock Lowry, Tim Dwinnell, Travis VanGaver, B. Stanley, Mark Stanley, Locking and McQuillin. Kurt Edwards stopped 36 shots while taking the loss. On Saturday night, a great crowd watch another exciting match between Huron-Kinloss rivals as the Lucknow Lancers paid a return visit to Ripley after a spirited game in the east end of the township before Christmas. Jamie Bayley got his first start in the Wolves net, but had a tough outing as the Lancers came out flying and scored on three of 11 shots in the first. Shawn Stewart got the only Wolves marker of the first, from Colling and Paul Stewart. Edwards entered the Wolves net for the second period and provided a steadying force for his teammates, who found their legs and began taking it to the young Lancer team. Locking scored a goal in the second, with assists going to Corey McCrae and M. Stanley. The Lancers added one to take a 4-2 lead into the third. Ripley came out flying in the third, taking the game to the Lancers and eventually being rewarded for their hard work when Locking scored his second goal, from McCrae and B. Stanley. Just a couple minutes later, deVos scored a shorthanded marker to tie the game at fours, setting up an entertaining finish. Just when it looked like the game was going to overtime, Kurt Colling entered the Lancers zone, caught the goaltender leaning and slipped a shot through his pads to give Ripley the 5-4 lead with just 12 seconds left. The Wolves hit the road in Palmerston on Friday and Shallow Lake on Saturday.